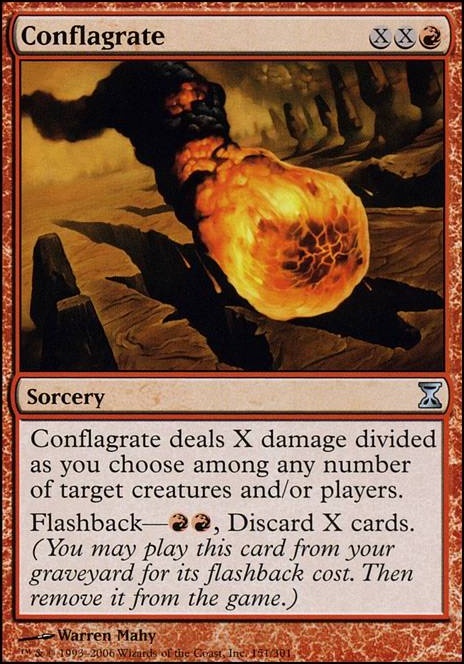 Conflagrate deals X damage divided as you choose among any number of target creatures, players and/or planeswalkers. I was thinking of casting Conflagrate for 0 and flashbacking it. There might be situations where you have a lot of cards in hand. 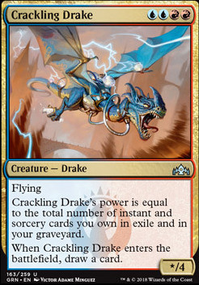 But, I cannot truly evaluate it right now since I don't know how good this decks card advantage is without having played it. the_schulze Yeah, Panic does seem worth it. Grapeshot is interesting, but it may be too conditional, and Conflagrate costs a huge amount of mana to start getting somewhere. Arcbond is kinda convoluted yeah. It's main purpose was to be a gotcha card, but I guess at that doesn't work too well with returning it to my hand. I'll replace it with Panic for now, but I have my eye on Grapeshot . I really like this deck. In its purity it might even be better than many non-budget builds. Not running any colorless utility lands really helps. On account of Sunforger I agree with keeping it out, 8 mana is a lot. Personally, I would play any one mana draw spells, even Panic . You could add Grapeshot or Conflagrate , they are in my opinion better than Arcbond (It seems convoluted to do anything with it). @PlatinumOne Okay, I'll give you Mana Leak . 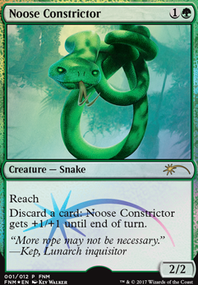 But if you've ever played with Remand , you'd know that it's actually waaaaay different than Counterspell . In short, while these interactions do not by themselves make Remand equal to Counterspell , they add up. 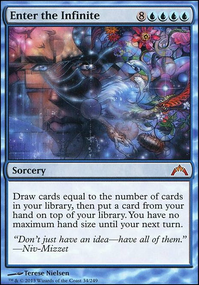 I personally don't see Remand going anywhere, because the decks that really use it really need it. I have certainly looked at those cards while going through my collection. The mana isn't really too much of an issue, and only ever seems to give me trouble when I keep one landers and don't hit a Dakmor Salvage or Life from the Loam. 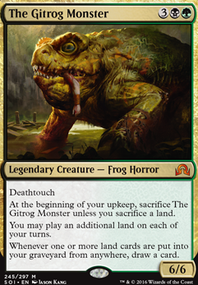 The dredge mechanic essentially makes it so that I don't need cards in hand for the most part - whatever lands are in my opening hand are likely to be my only lands until I hit Loam, at which point there is no real issue finding the colors I need. 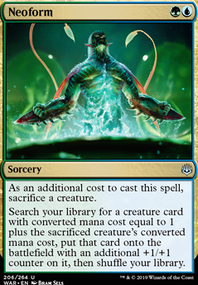 The only thing I need to be wary of is making sure I have access to Red, Black, and Green mana by turn 2 and in the right quantities. Usually Double red, single black, and single green are all I need for Conflagrate and Life from the Loam, but sometimes I need access to double black to cast Bloodghast or two Gravecrawlers, and I can't rely on loams or Conflagrate. Bad drawss leave me with one or two lands without the right color spread, but even these hands can manage to get 11 power by turn 2 or 3 if I'm very lucky. More consistently I get 2 lands with access to a third by the third turn and can muster 8-12 power. I meant Treasure Hunt, not Cruise. I was thinking of dumping the lands into a Conflagrate, Land's Edge, Lightning Storm, or something similar. I forgot to explain that line of thinking in my first post; this hypothetical deck would be built off my current Nin, the Pain Artist structure. I like the idea of Plasm Capture, and will incorporate it into my list. Thanks for the feedback!